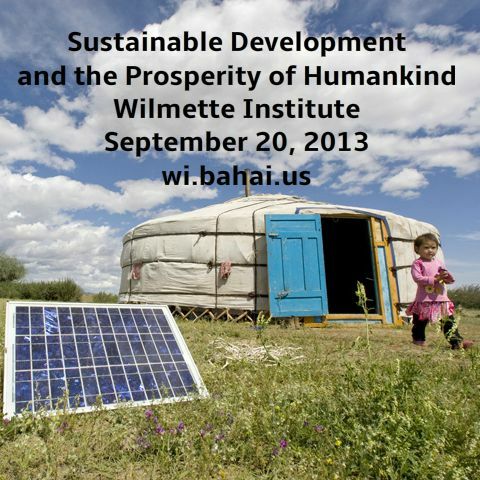 The Wilmette Institute is again offering its popular three month on-line course on "Sustainable Development and the Prosperity of Humankind" starting September 20th. The continuing series of United Nations on-line consultations on the post-2015 development agenda for environmental responsibility included the theme of Local Action, Innovation and Empowerment. The IEF submitted the contribution below on "Building Community Resilience" on 26 May 2013. Parts of this text were also included in the contribution on poverty, but are relevant here as well. The United Nations has launched another series of on-line post-2015 consultations, including one on Education for Sustainable Development. The IEF submitted the following contribution on 7 May 2013, based largely on recent statements from the Baha'i International Community, with an additional focus on sustainability. As part of the consultation on the Post-2015 agenda, the United Nations invited on-line comments on three themes related to Environmental Sustainability: Equality; Human Rights, Peace and Security; and Poverty. The IEF submitted comments on each of these themes, adapted from some of the statements it prepared for Rio+20. See http://www.worldwewant2015.org/sustainability2015. The Wilmette Institute on-line learning course on "Scientific and Spiritual Dimensions of Climate Change" which started 1 February for seven weeks is oversubscribed, with more than 50 participants. The Wilmette Institute has therefore decided to offer a repeat of the course from 5 May to 23 June 2013. The course was developed by Christine Muller and other faculty are Carole Flood, Karryn Olson-Ramanujan, and Arthur Dahl, all IEF members. It is based on the similar inter-faith course for local group use available on the IEF web site (http://iefworld.org/ssdcc0.html). Every year for the past three years, the national Baha'i administrative body in the United States has written to the American Baha'i community about the broad interfaith effort on climate change in collaboration with the United Nations, including the Baha'i International Community's Seven Year Plan of Action on Climate Change.